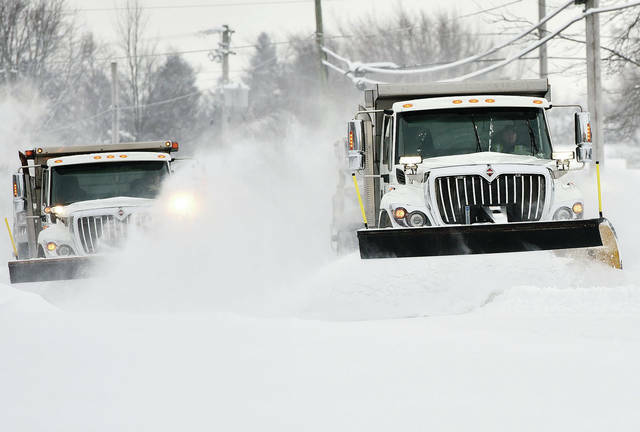 City of Sidney employees plow Wapakoneta Avenue, Friday, Feb. 1. 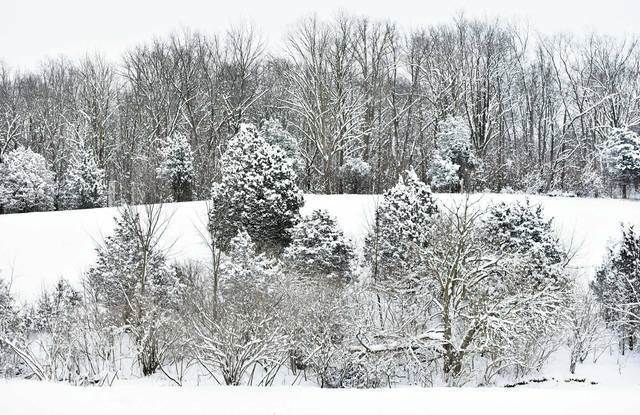 Snow covers trees on a hillside along Wapakoneta Avenue, Friday, Feb. 1. SIDNEY — The area was hit with another winter storm following a bout of freezing temperatures and wind chill, this time in the form of a thick snowfall. Originally predicted to bring anywhere from 2 to 4 inches of snow, the city of Sidney accumulated a total of 7 inches as a result of Thursday’s storm. The snowfall measurement was recorded at the city’s wastewater treatment plant. While not great for the morning commute, the snowfall did make for a picturesque scene as it lightly coated trees and homes. According to Mandi Dillon, public information officer for the Ohio Department of Transportation, crews were out on the roads as early as 8 p.m. Thursday combating snow and ice accumulation. Another issue, Dillon said, came from the freezing temperatures in the days prior to the snowfall, which led to a colder ground temperature, making conditions more favorable to ice. While increasing the ratio of Beet Heet to salt brine does help to counter the accumulation of ice on roadways, Dillon encourages drivers to remain cautious. Dillon also warns about the issue of “refreezing” overnight; although conditions may improve during the day, with colder nighttime temperatures comes the possibility of refreeze on roadways. To combat this, she says, crews will continue to be out on the roads, specifically in areas where refreeze is happening, known as “target” areas, such as bridges, ramps and overpasses. “We have seen some slide-offs and crashes, and we always try to remind drivers to slow down because you just don’t know in these conditions what is happening to the pavement,” Dillon said. Shelby County Engineer Bob Guey said while 7 inches of snowfall came as a bit of a surprise, it did not affect the crews’ efficiency. However, Guey did note the issue of salt brine’s being somewhat less efficient on roadways. As with ODOT, the county crews resorted to adding more liquid ice-melting solution onto roadways in order to combat the persistent ice. Guey said foremen were out on the roads Thursday evening surveying areas and monitoring the weather until about 4 a.m., when crews were called in to begin plowing and laying salt. Guey estimates that around 250 to 300 tons of salt brine has been used for this storm. According to Sidney Public Works Director Gary Clough, city crews began plowing streets around 4 a.m., Friday, as well. “We also pre-treated this time with salt and beet juice brine, which helped,” Clough said. As for accumulating ice build-up, when accompanied by freezing temperatures, Clough said there’s not much that can be done aside from using the salt and beet juice mixture. Another concern that becomes a possibility with particularly heavy snow and ice accumulation, and especially with heavy rainfall, is that of the river level’s rising to the point of flooding nearby areas. “A lot of that would depend on how quickly (the snow and ice) melts,” said City Manager Mark Cundiff. However, Cundiff said he does not foresee any issues with regard to flooding following Thursday’s storm and the resulting ice and snow melt. In the event of such an issue, Cundiff said, the city has multiple safeguards in place to prevent damage to areas near the river bank. This includes barriers filled with sand to keep water from flowing over the bank and into residential areas; storm water retention basins located around the city; and catch basins on streets to assist in the drainage of any accumulating water. Schools across the county canceled for another day this week after dealing with the frigid temperatures Wednesday and Thursday and the snow and ice on Friday. This weekend is predicted to bring a surge of warmer weather to the area, with temperatures expected to rise to around 49 degrees Sunday, and as high as 53 degrees Monday.